As a New Year begins, it opens the door for reflection. Now is a perfect time for me to reflect on my technological journey. When I began my journey to “open my classroom,” by “flattening the walls,” I spoke of the difficulties that I may encounter in this post: Connecting My Classroom. How is the journey progressing, you ask? Before I answer that question, I have learned some important things along the way. It was important to teach students about the “tool,” being integrated into their learning. Teaching how to use the “tool” effectively, allowed the focus to be more on engaging and meaningful learning. Taking the time to learn about the “tool,” was worth it. With this said, I realized the technological integration would be a gradual process. The type of technology I was exposing the students to: blogging, using the iPad, making iMovies was entirely new to the students. I had to take a step back and realize that the culture of my classroom would not be changed overnight, in one week, or even by the end of the school year. But you know what? That was alright, because I was witnessing progress, even though it was gradual. It is more important that the technology integration was effective, used in a meaningful way, and used to achieve curricular goals. So, how do I know if I have made progress and ensured that technology was integrated in an effective and meaningful manner? Students are enjoying blogging. Students want to have their writing posted on the blog and a smile appears on their face when their writing appears on the website. One student in particular became excited about the blog. Mentioning how she enjoyed looking at the blog and then took initiative to write posts and comments on her own time. The next day, another student mentioned he went home and commented on another classmates writing. The excitement began to build. I began to promote the blog within my school. Students were pleased to receive comments about their posts from other staff members. Comments made by staff members highlighted what they liked and what students could improve on next time. Slowly the importance of watching what they wrote began to emerge. Students became more aware of errors in their writing or in their classmates, resulting in students wanting to go back and edit their post or comment. Receiving feedback from someone other than myself on their writing was fantastic, as suggestions were similar to what students may heard from me. Writing a post and commenting all helps improve their writing, which was my goal. Then came the question, “When will other people from somewhere else comment on our writing?” This is where the struggle between technology and Mennonite culture begins. Do I take the next step and promote the blog to the outside world? Parents have signed appropriate release forms, have been informed about the blog in person or in my weekly newsletter. I have taught kids about the importance of digital safety, and I ensure information released is not personal. I may take that next step. With that said, if a parent does not wish for their child’s writing to be posted I will of course comply. Using the iPad was difficult as we only have one in the classroom and it is my own personal device. However, students were taught how to respect the device, share, and collaborate with each other. It was wonderful to see the excitement students had when using the iPad. After students took pictures of geometrical objects in our world and we posted the video on Youtube. Here’s the video: http://bit.ly/1aGQofF Students wondered how many views the video had. Those comments made me beam with delight! We continue to use the iPad by exploring iMovie and different apps. The last teaching tool I wanted to incorporate was Skype. I am still working on achieving this goal by hoping to set a Skype session with Judy Blume as we are reading, “Tales of a Fourth Grade Nothing,” and have one set up in January dealing with the Prairies, which is what we are studying in Social Studies. Technology has changed education and how I as an educator can leverage new educational tools to personalize learning, encourage collaboration, and prepare students for the future. 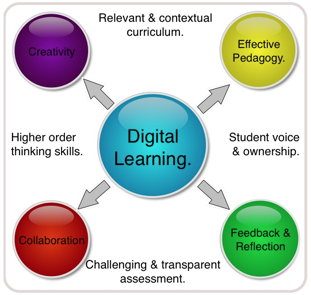 We need to learn and teach students how to properly implement technology into their daily work. 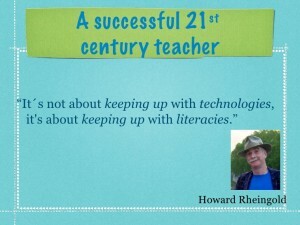 The quote below describes a successful 21st century teacher, but I feel the same quote can be used to describe a successful 21st century student. My journey and that of my students will continue until the end of the year. I’m excited to see where it leads.